Vol 1, No. 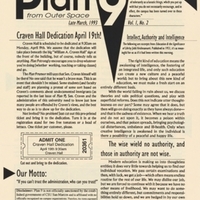 2 of Plan 9 From Outer Space highlights the Craven Hall dedication on April 19, 1993 and modern university education. Late March, 1993,” University Archives at the CSUSM Library, accessed April 20, 2019, https://archives.csusm.edu/student-newspapers/record/61.